“As a friend of mine observed recently, there is something medieval about Halloween. The masks, the running around in the dark, the flicker of candles in pumpkins, the smell of leaves and cold air — all of it feels ancient, even primal, somehow. Despite the now-inevitable preponderance of media-inspired costumes, Halloween seems, in execution, far closer to a Last Judgment scene above a medieval church door, or to a mystery play, than it does to Wal-Mart. This is an important lesson to learn, and one of the reasons I get a bit impatient at those Christians – usually on the Evangelical / Fundamentalist Protestant side of the Christian spectrum – who get into conniptions over Halloween, and often refuse to celebrate it at all. They are missing the point. They are also surrendering to the demonic far too much power: as Ms Thomas points out, we have no traffic with these powers, but neither need we fear them: Christ has already won the victory over them. Halloween is (or should be; admittedly, there are some who use it to celebrate darkness to a psychologically and spiritually unhealthy degree, but Christians should know better) about mocking the forces of darkness, not embracing them. It is, in a sense, a victory parade for the battle that was won for us on the Cross of Calvary – a celebration in which some may choose to wear the uniforms of the defeated enemy. And it is also, of course, a harvest festival, celebrating the turning-point between the season of warmth and light, and that of cold and dark… between, that is to say, the seasons of life and of death, or seeming death. And this, too, is a Christian mystery! “On All Saints’ Day, our parish holds a children’s festival, hugely attended, at which children and adults alike dress as their favorite saints… The party is such fun that we could almost dispense with Halloween, whose festivities, as we observe them, are minimal by comparison. But the cumulative iconography of being, first, a secular character confronting darkness, and then a saint in light, is imaginatively powerful and valuable. I think he would have been much in accord with the thoughts of Belloc, noted above, and also the author of theoldjamestownchurch blog entry linked above, who happens to be a (Facebook) friend of mine, as well as a fellow-priest, albeit of a different traditional Anglican jurisdiction. I grew up in a teetotaling Methodist household (to the point that I used to tease my devoutly Methodist mother about Christ “turning the water into Welsh’s grape juice” in the Wedding at Cana), so it was something of a relief to find myself in a Church which does not frown upon imbibing, intrinsically, so long as one does so in moderation. “Temperance is, unfortunately, one of those words that has changed its meaning. It now usually means teetotalism. But in the days when the second Cardinal virtue was christened ‘Temperance’, it meant nothing of the sort. Temperance referred not specially to drink, but to all pleasures; and it meant not abstaining, but going the right length and no further. It is a mistake to think that Christians ought all to be teetotallers; Mohammedanism, not Christianity, is the teetotal religion. “Of course it may be the duty of a particular Christian, or of any Christian, at a particular time, to abstain from strong drink, either because he is the sort of man who cannot drink at all without drinking too much, or because he wants to give the money to the poor, or because he is with people who are inclined to drunkenness and must not encourage them by drinking himself. But the whole point is that he is abstaining, for a good reason, from something which he does not condemn and which he likes to see other people enjoying. 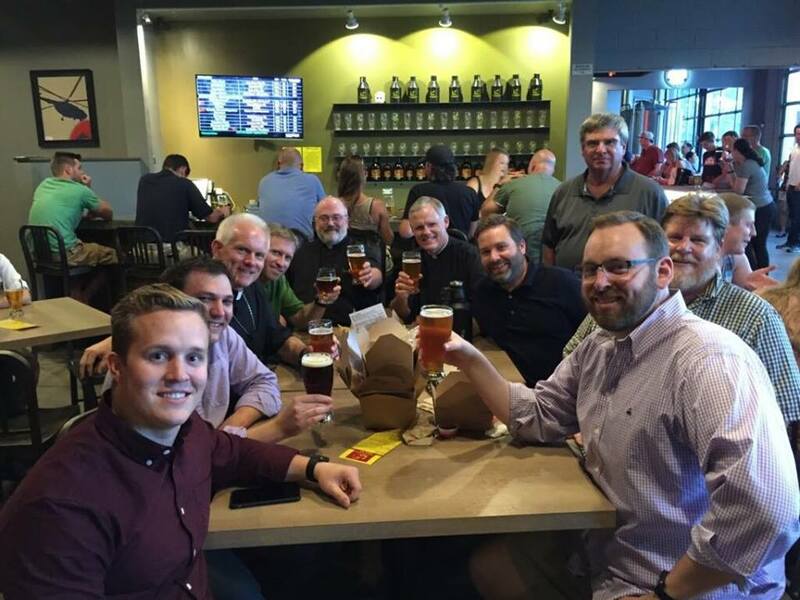 When it comes to Anglicans – a branch of the Church Catholic, whether our neo-Calvinist party, on the one hand, or our Roman and Orthodox brethren, on the other, agree or not – our history is one in which conviviality figures largely. Both in England and America, Anglicans have not been afraid to enjoy the fruit of the vine or the barley-field, a pipe of Old Dominion leaf, or a well-laden groaning board (*). In any case, the point is to enjoy such pleasures responsibly, in moderation: to exercise temperance, that is, in the old fashion. Some may not be able to manage this, and so, of course, should abstain entirely (no less a personage than the famous General Robert E. Lee, a model of self-discipline, temperance, and sobriety if ever there was one, once commented that “I like whiskey. I always did, and that is why I never drink it”). * It is arguable whether “groaning board” originally referred to a “board” (trestle table) so heavy with delicious foods piled upon it that the wood itself groaned with the strain, or whether consumption of too much of said tasty victuals (usually pronounced “vittles”) resulted in groaning on the part of those partaking – possibly both – but either way, it refers to the enjoyment of good food in substantial quantity! It has not taken long for the left-wing media – following Rahm Emanuel’s infamous dictum “never let a good crisis go to waste” – to politicize this latest tragedy, and use it as the latest argument in favor of stripping Americans of our God-given and Constitutionally-guaranteed right to defend ourselves. The irony in that will not be lost on those who have not succumbed to leftist ideological indoctrination. Automatic weapons were available to civilians for a brief period following the First World War, and prior to the National Firearms Act of 1934, after which they were and are NOT available to anyone who is not the holder of a Class III Firearms License – which is very hard to get, and requires extensive background checks and monitoring (and expense). When they WERE available, use of them in crime was limited to gangsters, which in those days meant organized crime families (which is why they were limited). So “automatic weapons” or “assault weapons” are a non-issue: as regards the civilian population, they do not exist. And lest you say, “b-b-b-but large-capacity magazines and semi-automatic rifles…!” let me remind you that the Texas Tower shooting, the first “mass shooting” by modern standards, which occurred in 1966, was committed largely with bolt-action and pump-action firearms. Let me remind you further that mass shooters are highly motivated individuals, who are unlikely to be deterred by such minor details as lack of availability of their preferred (or any) firearms. The Oklahoma City bomber did not need guns to kill 168 people and injure 680 more. The 9/11 hijackers did not need guns to kill nearly 3,000 people and terrorize a nation, scarring its psyche in ways that still linger. Terrorists in various locations, including New York City last year, have not needed guns to kill large numbers of people by ramming them with vehicles. Someone who is sufficiently determined to cause a massacre will find a way of doing so. And while banning guns may make them think a little harder for a little longer, it’s not going to prevent it; it is going to make things more difficult for law-abiding citizens who want to defend themselves and their families, or use firearms for sporting purposes. And that “18 school shootings in 45 days” meme that’s making the rounds? That includes eight incidents with no injuries or fatalities, two attempted suicides, one shot fired during the course of a fight, and two others that resulted in a single student being slightly wounded. And that is according to records found at “Everytown for Gun Safety,” Michael Bloomburg’s anti-gun advocacy group, which uses a very lenient (one could argue, highly misleading) standard: “any time a firearm discharges a live round inside a school building or on a school campus or grounds,” it counts as a school shooting, regardless of whether or not the shooting results in injury or death. While any and all of these are regrettable, placing them in the same category as what happened in Florida is disingenuous, to put it mildly. It is very easy to place the blame for tragic incidents like the recent Florida shooting on firearms. But – although the military is working on autonomous (AI) weapons (a concerning development, but tangential to this) – no firearm currently available to civilians is capable of engaging a target on its own. It requires a human being to make that decision and act on it. The 1931 girls’ rifle team outside Huntington High School, Huntington, New York. In the 1950s and 60s, it was commonplace for students to bring firearms to school, for hunting purposes, often leaving them plainly visible in gun-racks in their pickups on the parking lot, or sometimes keeping them in their lockers. Yet there were no school shootings. During the same period (and for decades prior), high-school shooting teams were common. Again, no school shootings. Teenaged students even carried firearms on public buses and trolleys, on their way from their homes (or schools!) to the outskirts of town to hunt. Again, no shootings resulted. The issue is not a gun issue. That’s an obvious but a misleading target – a “plausible distractor,” in testing terms. The issue is a societal and cultural issue, and a moral issue. It is a whole lot easier to say “ban guns” than it is to wrestle seriously with where we, as a culture, might have been going wrong – might be continuing to go wrong. And there is no single answer to that question, either; it is almost certainly a multiplicity of wrong steps, in a variety of areas. These include, but are not limited to, the failures of parenting Sandy mentions, plus breakdown of stable family units in general, the rise of media and recreational opportunities (including music, videos or other visual media, the video gaming Sandy mentioned, etc.) that glorify amoral or immoral violence while minimizing its consequences, the breakdown of traditional religious observances and the moral guidelines religion has traditionally provided (see Washington’s Farewell Address), and the breakdown of cultural cohesion – and the stability that provides – in a variety of ways. There are probably many others that I have missed. And until we seriously and constructively address these issues, the problem will continue. Banning or limiting (any more than they are already limited, which is severely) firearms will not solve it, it will only make things more difficult for law-abiding citizens, and chip further away at our freedom. Indeed. To tear a plant up from its roots and not expect it to whither is the height of insanity. And of course, the diminution and marginalization of traditional religious faith – particularly the Judeo-Christian religious tradition – and the moral standards which come from it has played a major role in stripping our society of its moral compass. 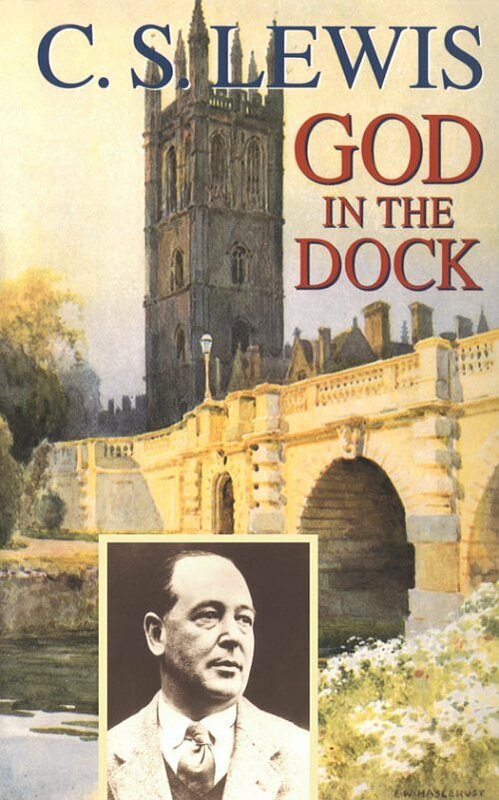 A sympathetic review of God in the Dock, a compilation of essays by the late great author and Christian apologist, C.S. Lewis. This is a blog post which is a review (well, more of a recommendation, but with commentary) of a blog post which is a review of a book. Such things may become problematic! At what point do they become circular, and self-referential? At what point, in contrast, do they stray too far from the thing itself? All I can say in response is, read this post, if you so desire, but then read Gerry T. Neal’s excellent essay – and then, above all, read C.S. Lewis’s God in the Dock! Don’t take our word for it, see for yourself. Like most (if not all) other writings by “Jack” Lewis, it is well worth the time and effort required. Time, because although the individual essays are fairly short, in the main, the collection itself is fairly lengthy. Effort, because although Lewis is a superbly gifted and engaging writer – at times provocative, at times witty and entertaining, and often both at once – he engages deep subjects, worthy of deep thought, and gives it to them. Words of wisdom… whether or not from C.S. Lewis! It seems that these words are not attributable to the great C.S. Lewis, after all, but they are excellent words, nonetheless, and very much in his spirit! Highly apropos, given our current political situation here in the U.S., too. Author The Anglophilic AnglicanPosted on January 28, 2017 March 10, 2017 Categories UncategorizedTags C.S. Lewis, Contemporary politics, HumourLeave a comment on Words of wisdom… whether or not from C.S. Lewis! It’s important to note that Romanticism is a reaction against, and response to, rationalism — not rationality, that is to say reason, properly understood and exercised. The Romantics, and certainly the Inklings who were among their heirs, understood and valued reason as one of the faculties with which humans have been gifted by a loving Creator. But like everything else, it was to occupy its appropriate sphere, not either more or less. One of the definitions of a “heresy” is a truth which is carried to such an extreme that it becomes no longer true. By that standard, the rationalist heresy is the idea that unaided reason is the only way one can, or should, understand the world, and everything must be subjected to the test of reason. If you cannot reason (or experiment, as empiricism is part of this) your way to a conclusion, it is suspect at best, or to be rejected absolutely. This is a view common to both Modernist and, to a very significant extent, post-modernist thought as well. The fruits of reason are not to be despised, then, but merely understood within their own context, and neither expected to take us beyond reason’s proper sphere, nor to be meekly accepted when they attempt to do so. The deification of Reason, the assumption that it is the be-all and end-all of existence, was for the Romantics and the Inklings, and is for me, to be rejected: it is like the wings of Icarus, that take us too high, too close to the sun, so that we fall to our doom. It is the very definition of hubris, of arrogant over-reach: the pride that goeth before the fall, the creature seeking to pass judgement on the Creator. But these are just my own meanderings on one piece of the puzzle. The whole article is fascinating, and only touches on the rationalist heresy as it applies to the Inklings’ political philosophy. Read and enjoy!